There were two different regulations made as a guide for the rules that need to be followed when working with hazardous materials to ensure that biological and infectious substances are appropriately handled and shipped safely. As part Title 49, the Department of Transport (DOT CFR49), was made to issue some requirements that shippers of these materials need to follow. Section 137 goes into details about the various packaging methods in regards to various modes of transportation, the different specifications and the responsibilities of the shippers. UN3373 Category B packaging regulations were also made to individually handle biological and infectious substances, which goes together with the CFR 49 requirements. This packaging needs to include the container to hold the material, a material that is wrapped around the container in case of spills, and an outer packaging container for it to be transported in. When potentially hazardous bio-waste is moved around within, or outside of a testing lab, blood bank, medical facility, morgue or surgery center, it needs to have enough absorbent material inside of it to protect the waste container unit in case it leaks, or breakage occurs. 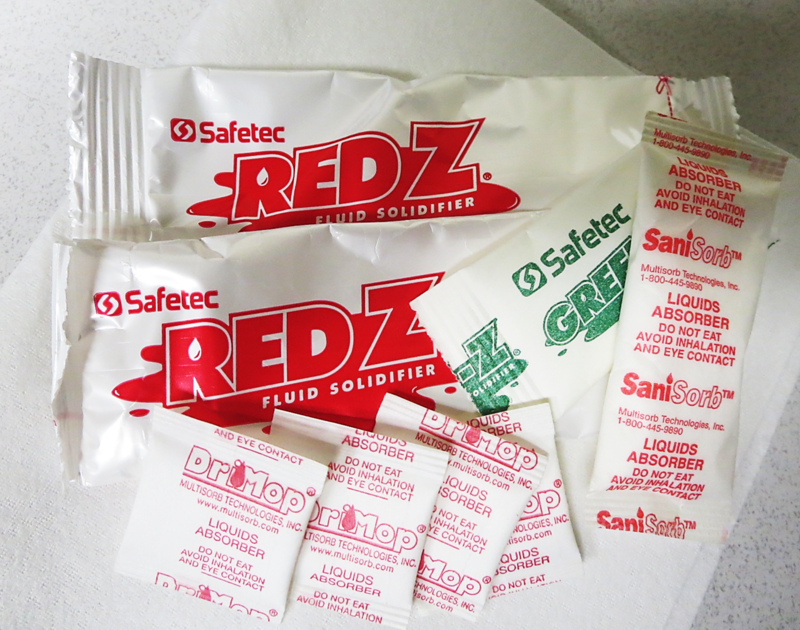 Available in fast-acting pouches or laminate sheets in various sizes, this is where Safetec of America and MultiSorb fluid solidifiers can help! We Have Safe Compliance Packaging and Specimen Transportation Products Here! Self-dissolving liquid medical waste solidifier pouches are made with super absorbing polymers and are easy, effective and affordable to use. Medical liquid solidifier pouches use self-bursting technology to quickly absorb and encapsulate blood or body fluids into a semi solid gel. In the presence of fluids, these pre-measured self-rupturing pouches eliminate the tearing and spillage associated with conventional products. Self-activating technology reduces particulates and bacterial exposure. Available in various sizes, the pouches dissolve within minutes on contact with fluid to quickly absorb and immobilize fluid and reduce bacterial exposure. They can be used along with the self-dissolving sheets listed below. Laminate paper solidifiers are a fiber based paper bonded with an immobilizing agent and provide the same fluid control protection as packets but are ideal in areas where space is a premium. Available in various sizes, laminate paper sheets can provide effective fluid control in almost any size or shape container and can be used along with the pouch delivery systems described above. Used alone or together, these spill control compliance products reduce handling, shipping and compliance risks of diagnostic specimens, infectious substances or dangerous goods and prevent cross-contaminaton within the facility. Constructed with water-soluble paper and super absorbent polymers, they make cleaning up spills quicker and easier. They also helps comply with DOT, CDC, OSHA, IATA, ICAO, US Postal Service and United Nation Regulations. +Browse our Fluid Containment Products or Try a Sample Today! Contact MDS Associates Monday through Friday 8:30am - 4:30pm EST. We Want You to Go Home Safely...Everyday!